From Spain back in Greece: we greeted the experienced Irish Instructor Damien Cahill who wanted to convert his Irish ratings into the USPA System. Bringing all the requirements and pre-tasks, Damien spent one weekend under the supervision of Marcus and completed his evaluation successfully. 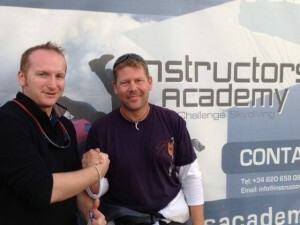 Damien is now in the proud possession of his USPA Coach, Static Line and Tandem Instructor Rating. Well done Damien and thanks for booking with us!